Easy peasy recipe, with just a couple steps, perfect for a weeknight dinner. Add salsa, lime juice, and taco seasoning to pot and mix well. Add chicken breasts to pot and press them down to submerge them in the salsa. Cook for 10 minutes at high pressure. Transfer chicken breasts to mixing bowl. Using 2 forks, shred chicken into small bite-size pieces. 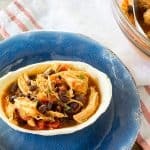 Return chicken to pot, add black beans, and mix well. Allow to sit for 10 minutes before serving. Serve with rice, in tacos, or as-is!